Upon our departure, we will be leaving Port Tarpon Marina in Tarpon Springs, Florida and head south. Our plan includes stops in Venice, FL and Pelican Bay (just north of Ft Meyers, FL) before turning east to transit the Okeechobee waterway (where the boys will get their first experience of transiting a series of locks). Once on the east coast of Florida we will stage for our Gulf Stream crossing at Lake Worth, West Palm Beach. Heading further east, we will cross the Gulf Stream and make landfall at West End, Grand Bahama Island in the Bahamas. After clearing customs in Grand Bahama we will be cruising first the Abacos then Eleuthera and the Exumas where we hope to spend Christmas 2014 in Georgetown. 2015 will see us transit the southern Bahamas to the Turks and Caicos before heading for the Dominican Republic. A trip across the Mona Passage and the southern coast of Puerto Rico will follow. After Puerto Rico we will traverse the Spanish Virgin Islands, USVI, and the BVI. Our first stop south of the BVI will be Saint Martin followed by St Barts, Guadeloupe, and Martinique, St Lucia and Grenada by June 2015. Once in Grenada we will have some decisions to make. Should we decide to head to the Western Caribbean we will need to supplement our fuel capacity with a temporary fuel bladder system. The fuel bladder will enable us to make the approximately 400 nautical mile transit from Grenada to the ABC islands. From there we will proceed to Santa Marta Columbia, Cartegena and ultimately to Panama. 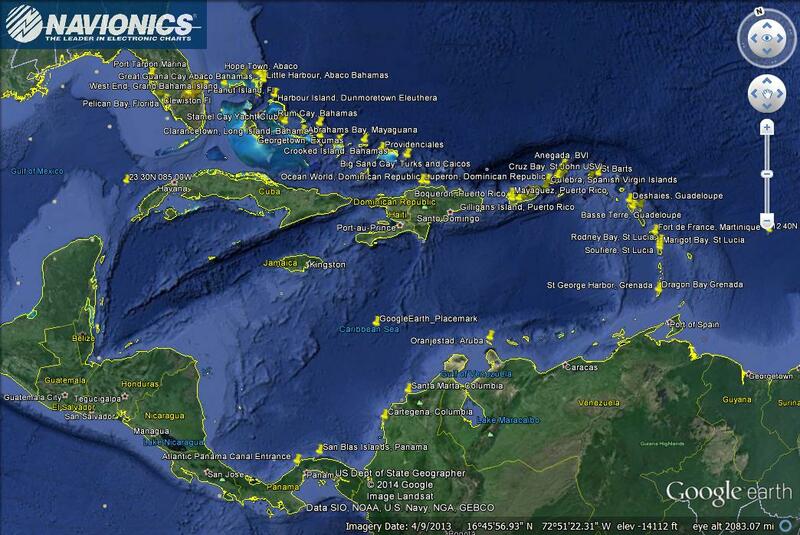 We have prepared a Google Earth map with yellow position pins to highlight some of the stops we will be making. You will note that we have entirely avoided a number of the islands of the Caribbean and the reason for that is that they are not dog friendly. If our Cocker Spaniel Patton is not welcome, we will spend our cruising dollars elsewhere.